Today was Day #3 of Chocolate and Hazelnut Theme Week. There was a wealth of high-quality chocolate and hazelnut flavor condensed into this small glass jar of Gianduia Spread from Arete Fine Chocolate (Milpitas, CA). 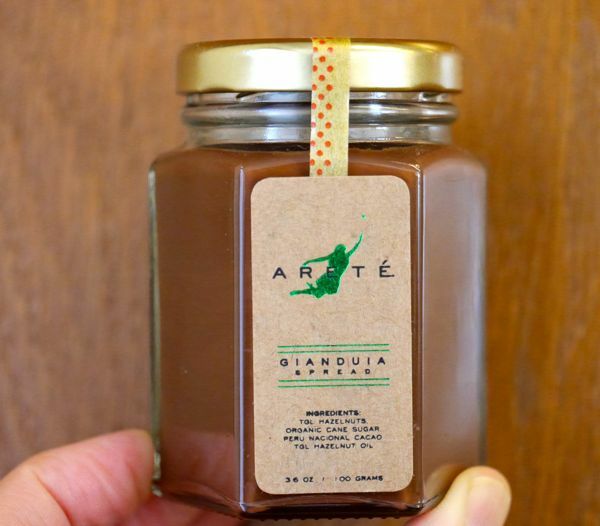 This spread was made from a revered Northern Italian hazelnut cultivar Tonda Gentile delle Langhe (TGL) hazelnuts and hazelnut oil; organic cane sugar; and Peru Nacional Cacao. TGL hazelnuts are known for their sweet, round character, lack of bitterness and astringency, and great flavor—especially when mixed with chocolate. This hazelnut flavor surfaced now and then as it intermingled with the sweet fruit acidity of the Peruvian cacao—the latter emerging as the dominant player. Artful balancing act between two high-quality, alpha flavors. The texture was great, as was the melt. It was great on gluten-free warm crepes, pancakes and toast. I have, in the past, grumbled about anemic flavor inclusions in some chocolates. 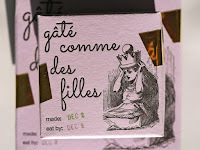 Today's Gate Comme Des Filles chocolates, however, had a light, creamy but robust, fresh Meyer lemon flavor and each was adorned with a glistening strip of candied lemon peel. Every ingredient, including the chocolate, tasted like it was of the highest quality. Both chocolates featured today were executed by skilled craftspeople who care very much about quality. 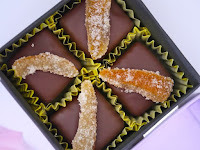 The mental image that appeared to me when eating these lemon chocolates: A ballerina gracefully crossing the high wire with a smile on her face; a beautiful balance between bittersweet, dense citrus peel and a sweet, flavorful, almost souffle-like lemon-infused chocolate ganache. An absence of over-sugaring gave the flavors in this chocolate room to blossom. The tart sweetness of these lemon chocolates paired nicely with a hot cream biscuit and Arete Gianduia Spread (described above). 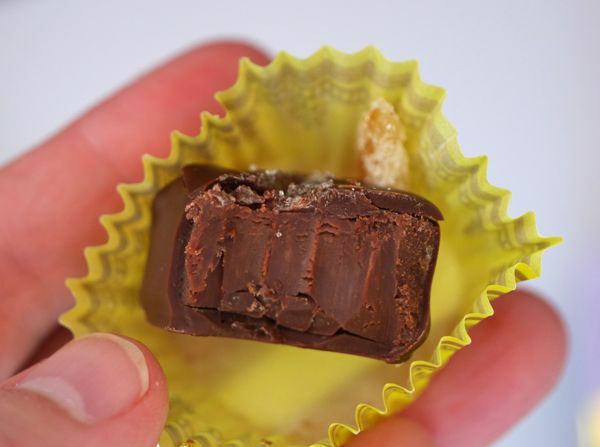 Chocolate, lemon and hazelnut can be a delightful trio. 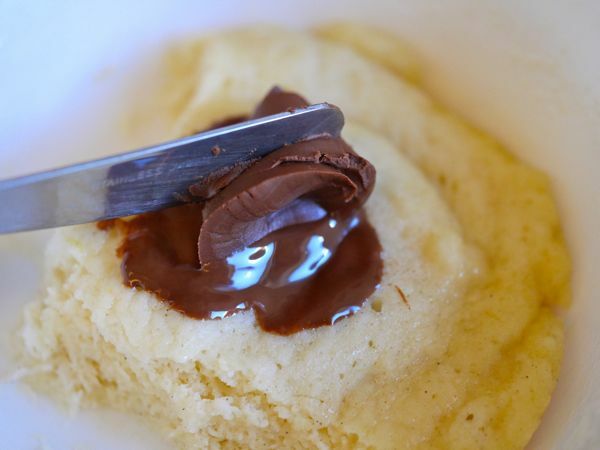 Add a shot of espresso with this combination, and one could imagine sitting in a cafe in Rome, Italy. However, these lemon lovelies would be right at home in Paris, Palo Alto, or anywhere else for that matter. The name Gate Comme Des Filles (roughly translated means "spoiled like the girls"), is the creation of Alexandra Whisnant (who trained in France and worked at Chez Panisse, a Berkeley, CA, restaurant famous for fresh, seasonal flavors). Alexandra's other truffles include ingredients like fresh walnut, garden thyme, vanilla bean, and other flavors—all best eaten, like most truffles, within 3-5 days of purchase if possible.